This image was produced by scanning from live specimen found near Saddle Mountain, Maricopa County, Arizona, USA, March 1st, 2008. FRUIT: Long, slender two-celled capsules flex downward as they mature. FLOWERS: Small white flowers are crowded at the top of the tall stem which elongates considerably as the fruit capsules mature. SPRING ANNUAL: Present in years with good winter to spring rains. Sometimes as tall as a meter with usually one or a few slender stems. LEAVES: Elyptic leaves are sharply lobed and tend to be larger at base of plant. 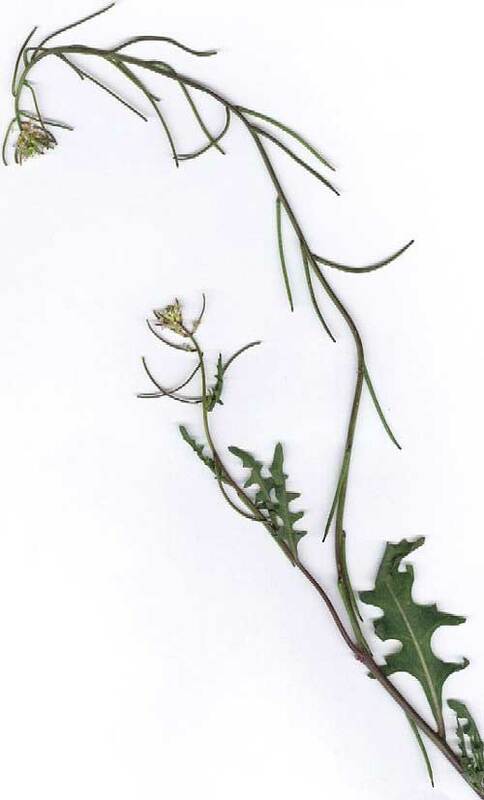 STEMS: Entirely herbaceous and ephemeral. RANGE: Common across the Sonoran Desert on rocky slopes, in washes and on flats depending on rainfall. Superficially this mustard looks like our two introduced weedy species (London Rocket (Sisymbrium irio) and Sahara Mustard (Brassica tournefortii)). Niether of these plants have mostly white flowers nor the deflexed pods. This is a highly variable lineage of mustards and has received many names for the various forms that appear across the western United States and in various habitats. Variable characteristics include degree of pubescence, flower size and overall stature. Another name that has been applied to this plant is Thelypodium lasiophyllum. In the photo at right, a small colony of aphids (Aphis sp.) 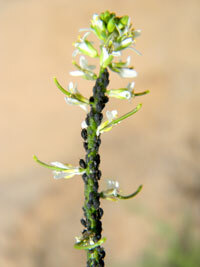 has established on this flowering spike. Within a few short weeks the plant will wither and the aphids will have completed several generations. The aphids will then enter a state of estivation to wait out the hot summer ahead. Native plants like this one exist with a bevy of herbivores that make up the Sonoran Desert community. The aphids become food for birds, lizards, lady beetles and spiders. Google Scholar Literature Search Old Name 1! Google Scholar Literature Search Old Name 2!